Surfers waiting for 'that' wave. September is time to get your things together as a teacher, prepare for your new classes, meet your new students and get all of your routines down. You build your classes, build good relationships with your students to make the coming year easy for everyone and maximise learning. Luckily the first term has a few long weekends and public holidays which help you ease back into the work life. 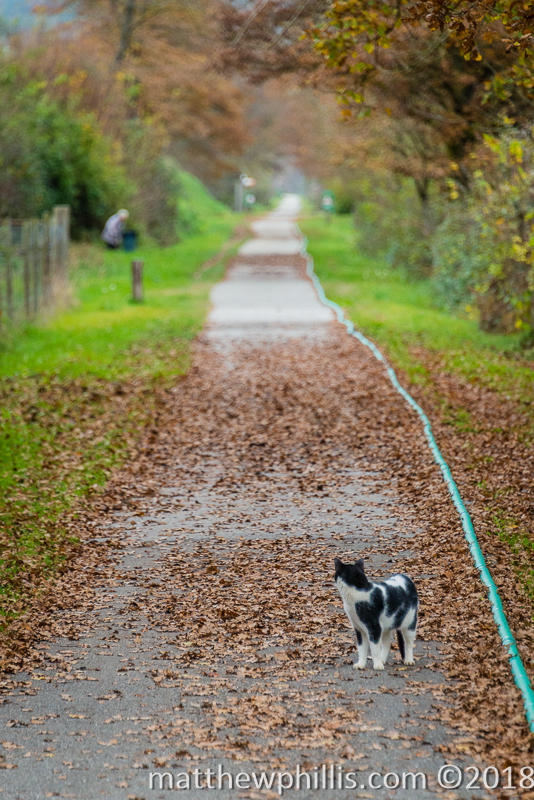 October in many places is when the weather changes from the end of Summer to Autumn and moving onto Winter. No so here in Barcelona! I love living here for one of these reasons - the warm, sunny weather can continue right into December! With work building up and the weather still sunny and warm, there's only one thing to do - head out and walk! 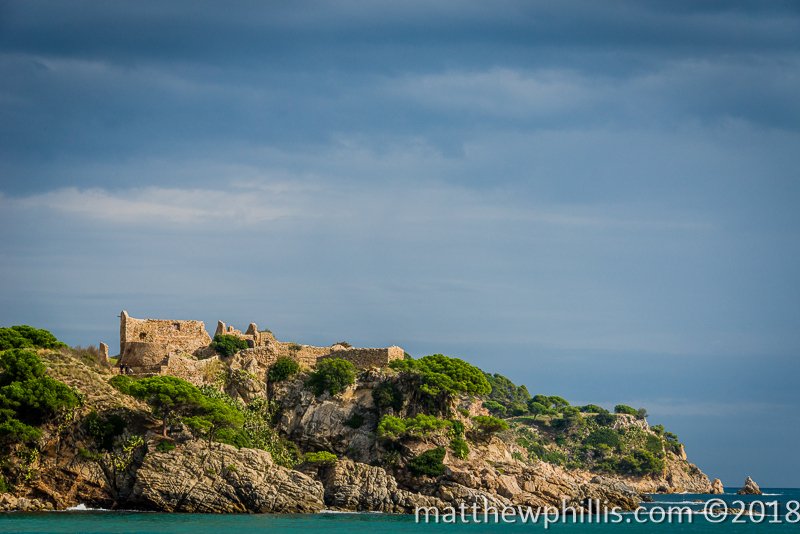 Somewhere I always love going is the Costa Brava, the coastline just North of Barcelona. 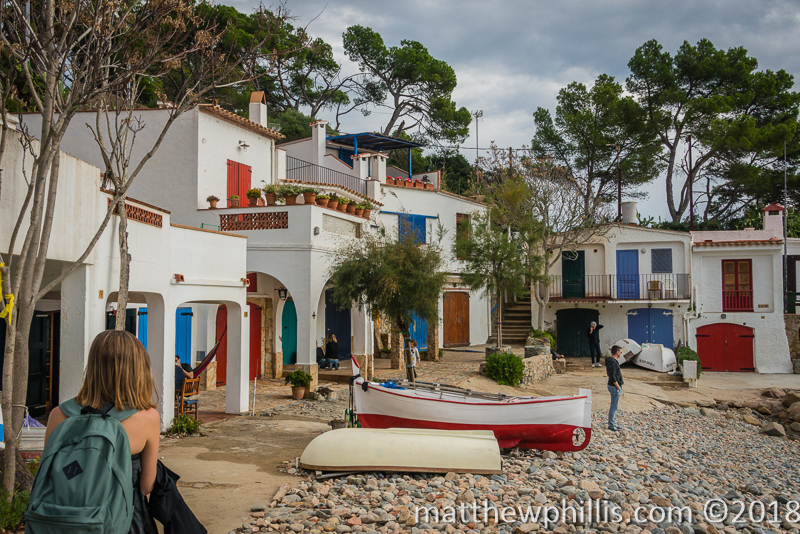 This area is sums up Catalan village life - white plastered houses with colourful doors, small bars serving cold beer, tapas and seafood dishes, with the gentle Mediterranean lapping at sand and pebble beaches. Simply idyllic! 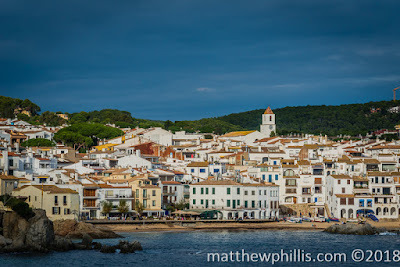 Although there are many places to visit along this stretch of coast, I personally love the town of Cadaques, an absolutely spectacular place, all white houses perched right on the sea and protected from behind by soft, curving mountains. I've visited here so many times but I'm always to go back again. 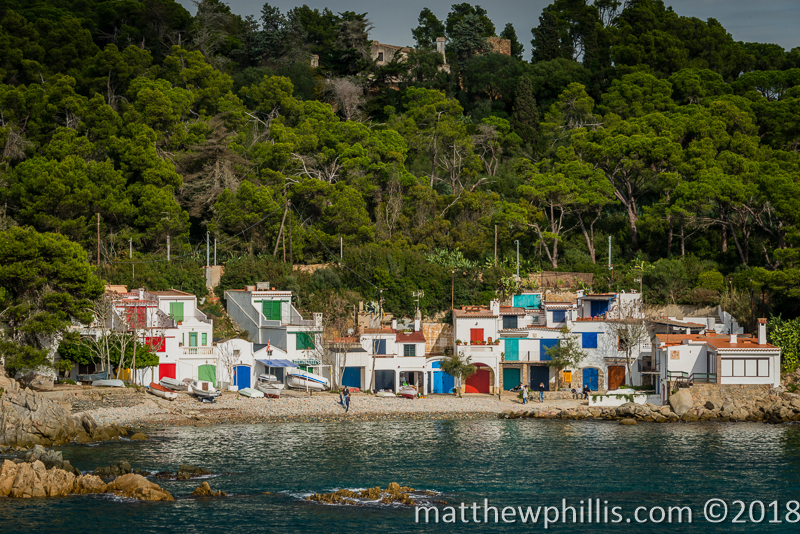 Another place I love along the Costa Brava is Calella de Palafrugell - my destination for this trip. 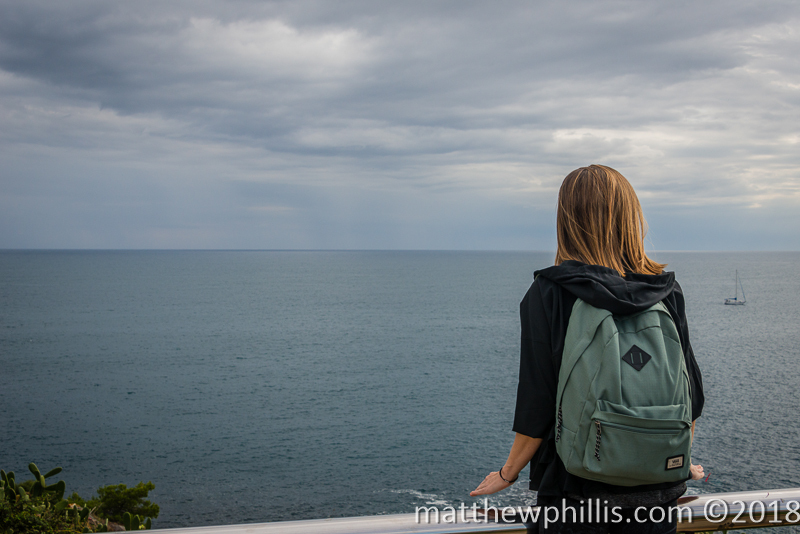 I decided to walk some of the Cami de Ronda, a easy yet stunning coastal walk done by my many people in the Spring and Summer months, but I would be doing it in November. The weather was perfect now - still very sunny, warm but not at all too hot or too cold. It was just right! 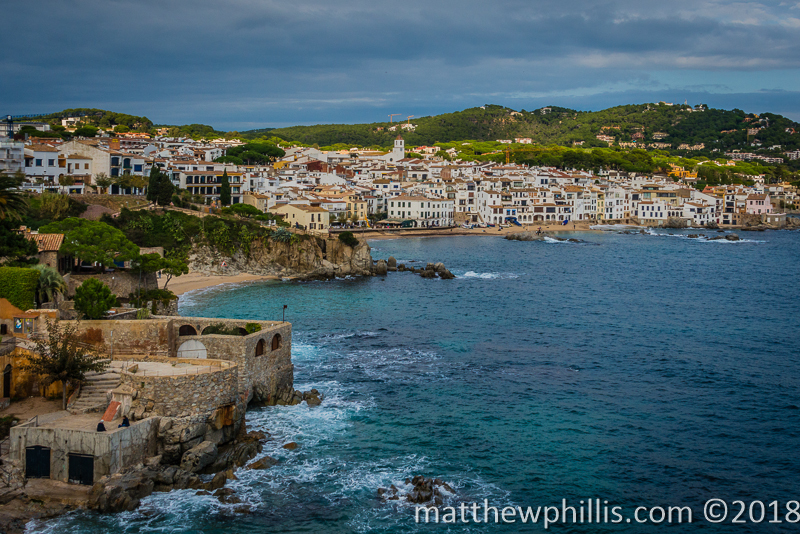 The Cami de Ronda on the Costa Brava. How many places in the World can you walk, in mid-November or late-Autumn, on the coast in shorts and a t-shirt? Well, Spain is one of those places! 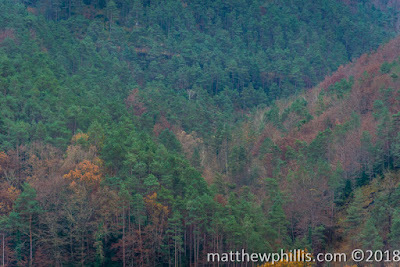 The North coast of Galicia and Pais Basque may be good for surfing but the weather is slightly less forgiving. You can't have everything! But move South, to the Costa Brava, Barcelona, Tarragona and Valencia, the weather gets warmer and warmer and you'd hardly think Winter was around the corner at all! I know it everyday - I'm very lucky to live here. Not only the weather but also the things that are just here waiting to be done - mountains, sea, forests, cities. Sometimes I don't think people here realise what they actually have compared to a lot of people. Anyway - it was time to take advantage of all these things and walk! To get to this walk, its easy by car. However, I don't have one, so I decided to rent one for the day to make life a little easier. You can do it by public transport, but it's a fair way and on a Sunday there aren't many buses and they aren't cheaper. I was going with a good friend so as there were two of us renting a car for the day made sense. We got up early and picked the car up from the airport (the only rental car place open on a Sunday), we got straight on the motorway and headed North! Even having a car, there is a complication in the mission to walk the Cami de Ronda - I'd planned to start at Palamos and walk to Calella de Palafrugell - but the car would be where I'd started so the question was, how would I get back? It seems you can't avoid public transport unless you have 2 cars. 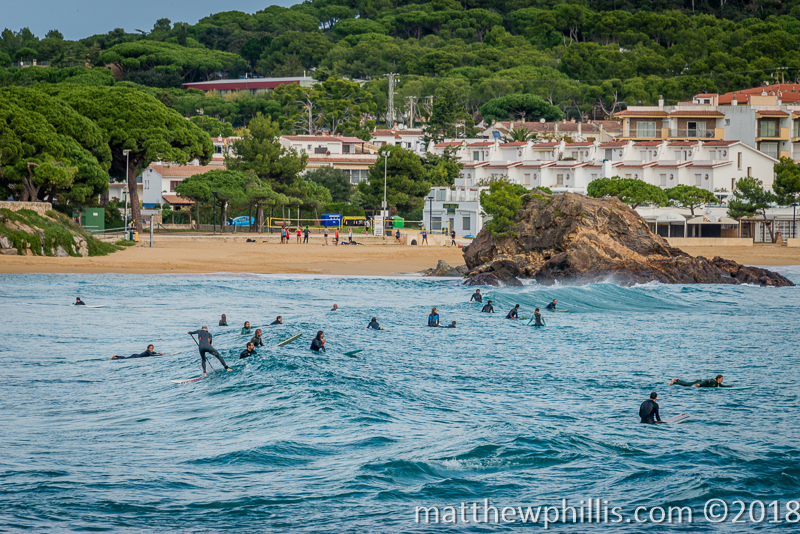 The story of how I got back to the car will come later, let me start at the start, at Palamos. We parked the car in a free, council car park (only on Sundays), and headed towards to the beach to start the walk. I will say it here now how lucky people living here in this part of Catalonia - the have beaches all along the coast, The Costa Brava and the Costa Daurada South near Tarragona, mountains like Montserrat and Montseny, not to mention Pedraforca and The Pyrenees. There is also the wonderful weather - this walk was done in November, the end of Autumn, when most other European countries would be freezing over with no sun at all. This walk was also in shorts and a t-shirt, with a light jacket for the wind, that's it. 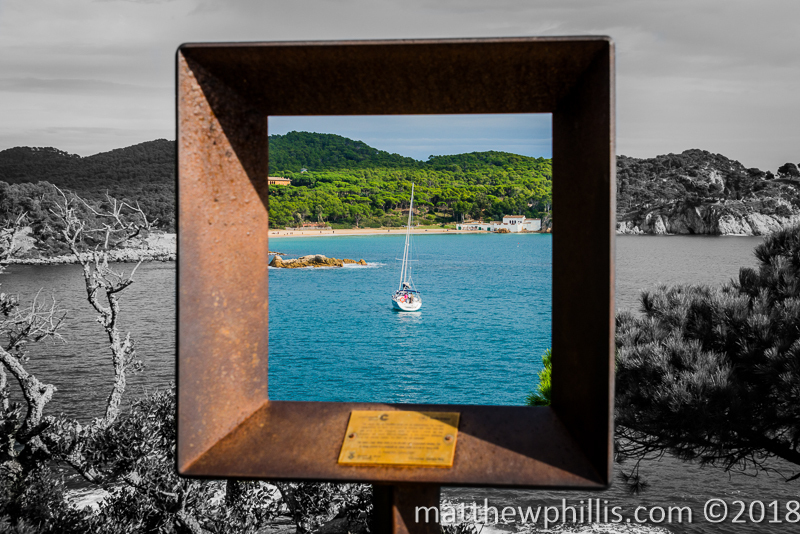 Cala de la Fosca - small and very cute. 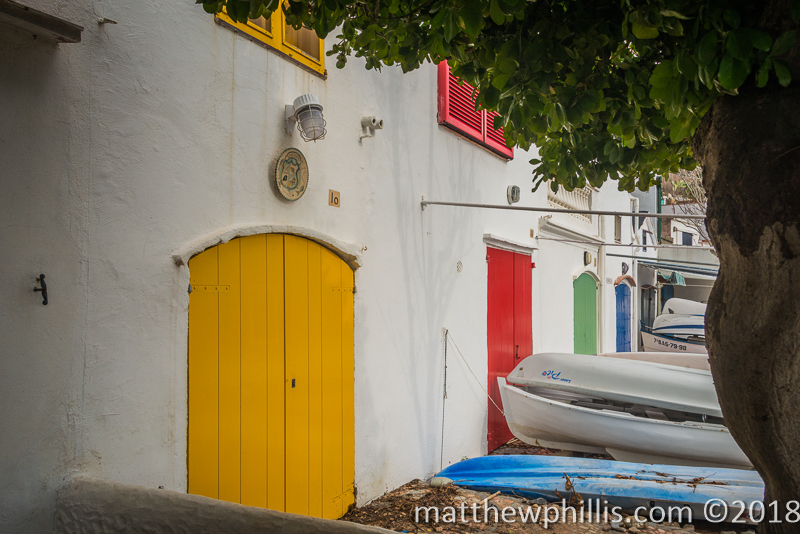 A few houses, boats, a hammock and the sea - what else do you need? All the houses have different colours. Would you ever get sick of this view? 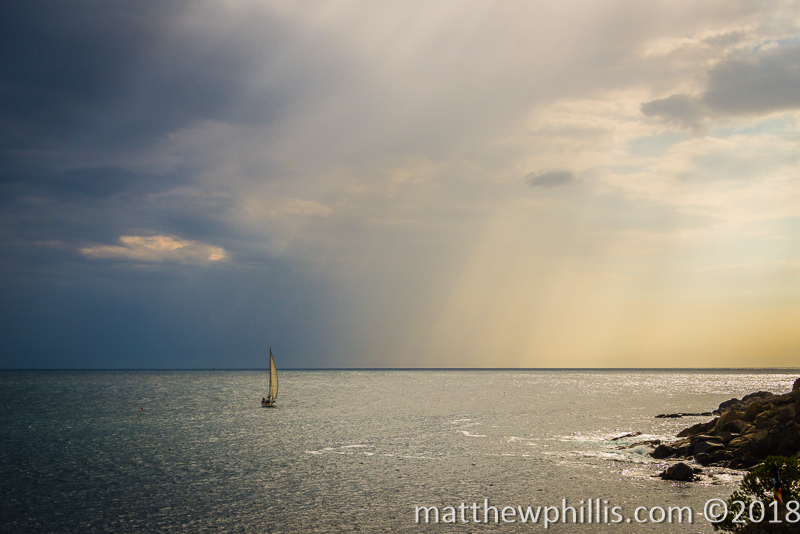 The walk was easy, the sea on our right hand side, the sun in the sky. 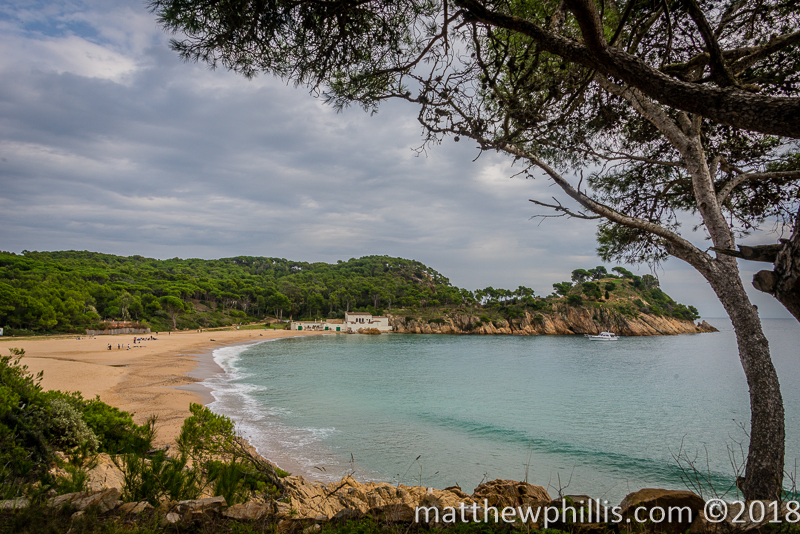 Not long after we set off we came to a cute little beach village, Cala de la Fosca. A sandy beach stretched out along the coast, people were walking their dogs along the boardwalk and surfers were floating around, waiting for that wave. Although we hadn't been walking for that long, it was nice to sit here and crack open a beer and enjoy the weather and the peaceful view. I don't know if I would ever live here, but it was nice at the time and so we sat, drank our beer and snacked, watching the surfers, taking some photos, and trying to get an autumn tan. Overlooking the beach is the Castell De Sant Esteve, a ruined medieval castle that sits on a rocky perch jutting out to sea. It was close today, being Sunday, but there isn't much left but a tower and some stone really - the location is what makes it though, and has been built on since Roman times, and possibly even earlier than this. 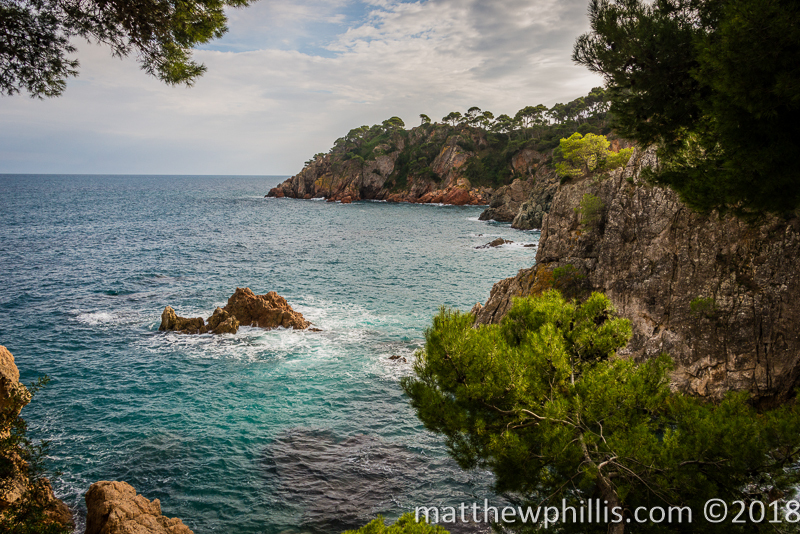 Continuing on, we walked right up to and through my favourite little "cala" or cove, Cala s'Alguer. This little village of a few white-washed houses, doors and window shutters painted in an assortment of bright, primary colours, is whatever I think of when I think of the Costa Brava and the Catalan coast. There are no bars or supermarkets, and this would simply ruin the feel of the place altogether. I'm sure Airbnb already have a few people that rent out their place here, and it wouldn't be cheap, but what a place to stay! I stopped for a few photos of this little gem, walked through it in less than a minute, and then it was behind us, hidden once again by the rocky coast and treeline. Continuing along the Cami, you can find many small coves, all hidden little gems in their own way, some a few houses, others just a big rock, some sand and the sea. The final destination however is Calella de Palafrugell, which again seems to appear out of nowhere from the tree and sea, the path just opens up there it is! The day was getting a little later and we were worried about not making it back to the car by public transport, so we didn't spend much time admiring this beautiful town unfortunately. We managed to get a bus by walking to the nearest decent sized town a few kilometres away and got back to the car as the sun was setting - perfect timing. 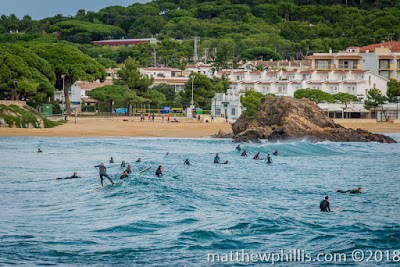 If you ever come this was, you must stop in a Calella de Palafrugell, even on a Sunday - the waves lap at the beach, small sail boats have been pulled up on the sand, kids and dogs play on the beach and the town's populace laze around eating good food and fine wine in the sun. It really is the Spanish Life! 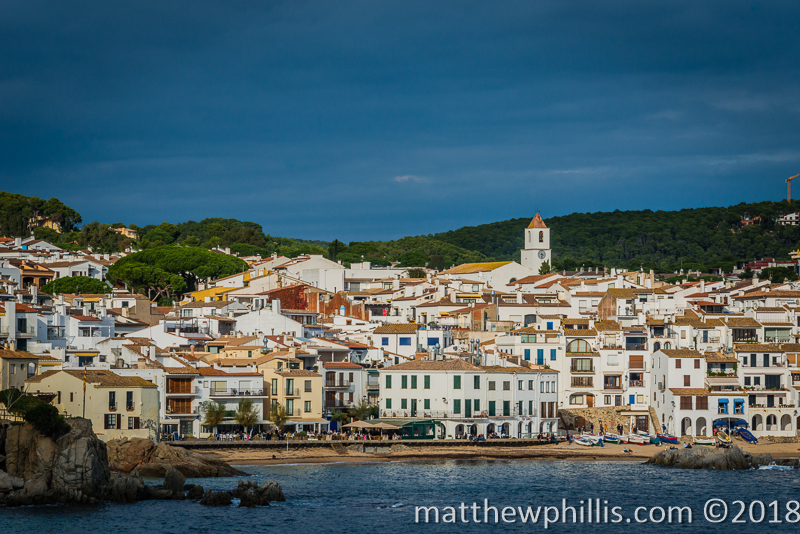 Calella de Palafrugell - a perfect example of a Catalan coastal town. 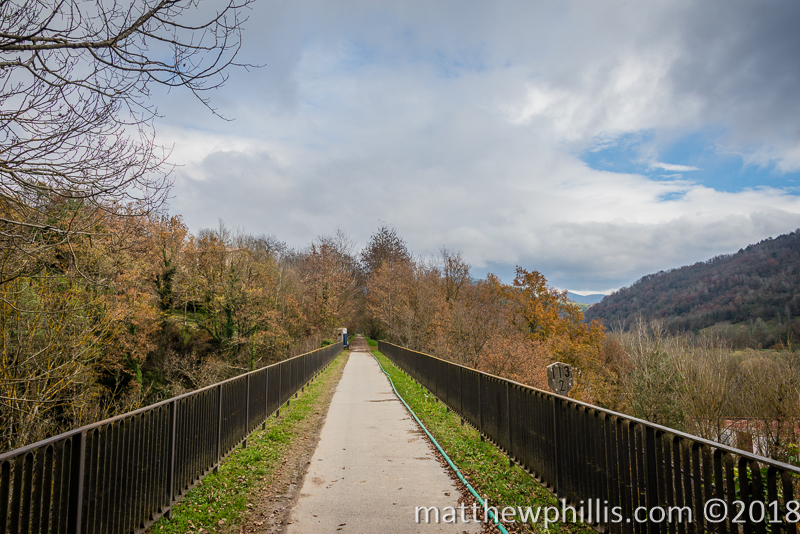 The walking path from Ripoll to Sant Joan de les Abadesses - easy and with mountain views. The Ruta del Ferro in Autmn. Our cat for (part of) the walk. 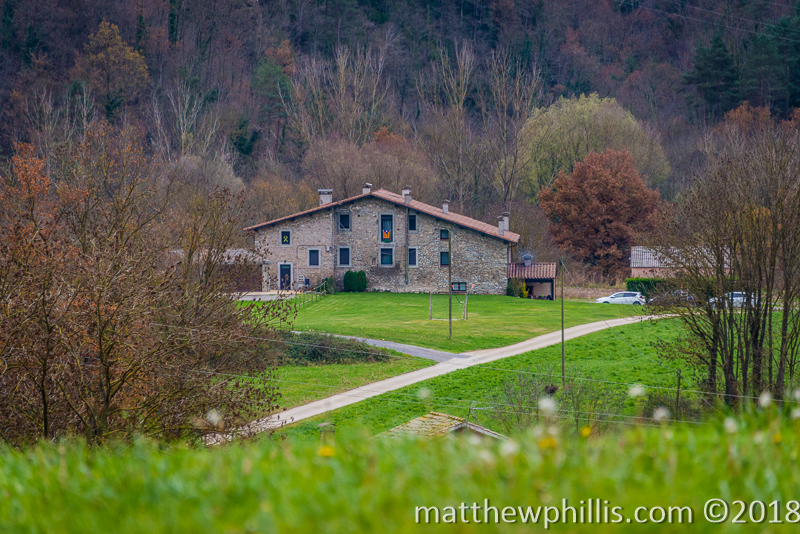 Another trip that I did around this time was he walk from Ripoll to Sant Joan de les Abadesses, along the Ruta del Ferro. This is a trip that is best (in my opinion) in Autumn when the weather is cooler but the there are also more colours in trees. I'm sure Spring or Summer would also be lovely, as this area would be bursting with life, I love seeing the green, yellow and read leaves all mixed in together with the coming of Winter. This trip was also done with the same friend who I'd gone to the Costa Brava with, someone who was now quickly becoming a good walking buddy. We got the early train from Barcelona to Ripoll, a journey of around 90 mins, leaving early enough to see the sunrise in the city. The train to Vic and Ripoll is different to the normal Barcelona trains - this one is more of an intercity train, built for long medium distances. On the train the seats are more comfortable and there are also bike racks and more space for skis and big bags. Every time I get the train on the weekend, I see this train go past and dream of just getting on it and heading north into the mountains! The train ride was nice, but getting out at Ripoll was a little bit of a shock as the temperature was much cooler than Barcelona. A quick walk into the centre and a coffee and breakfast was ordered for a pre-walk breakfast to warm us up and give us some energy. 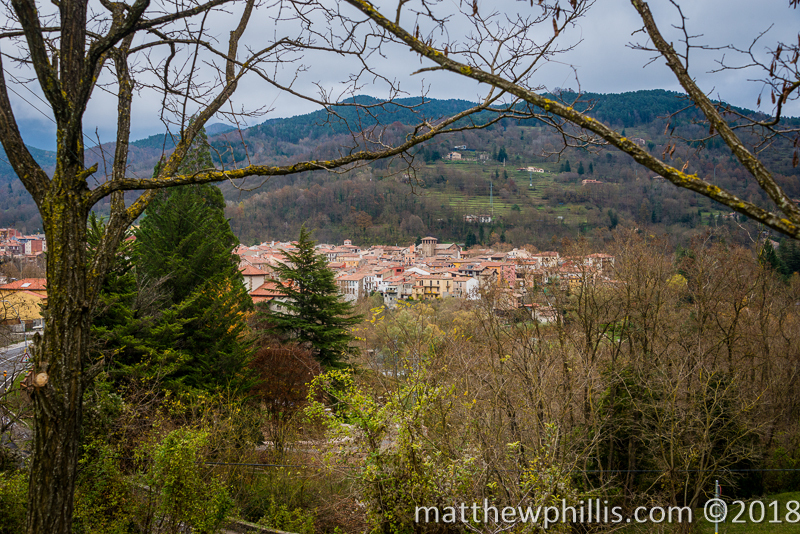 Ripoll is a lovely city, although small and not really high on the list for tourists. It's the capital of the Ripolles 'comarca' or county, with a population of about 11,000, but it was once very important in the country's history. The Benedictine Monastery was founded by Wilfred the Hairy in 879 the city was used as his base of operations while on his mission to repopulate the area after it'd be conquered back from the Count of Barcelona. Up to the mid-19th century it was an area with a lot of industry, due to plentiful deposits of coal and iron ore, as well as 2 rivers to transport products that were manufactured. Ripoll become famous within Europe for producing simple items such as nails, to bigger exports like polearms, crossbows and later firearms. 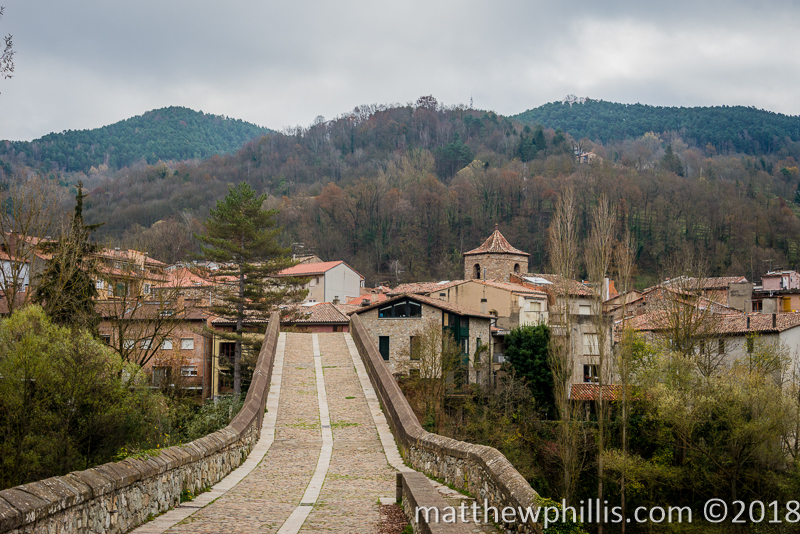 Sadly after the Carlist Wars, Ripoll was nearly lost and so remains a small, less important city today. 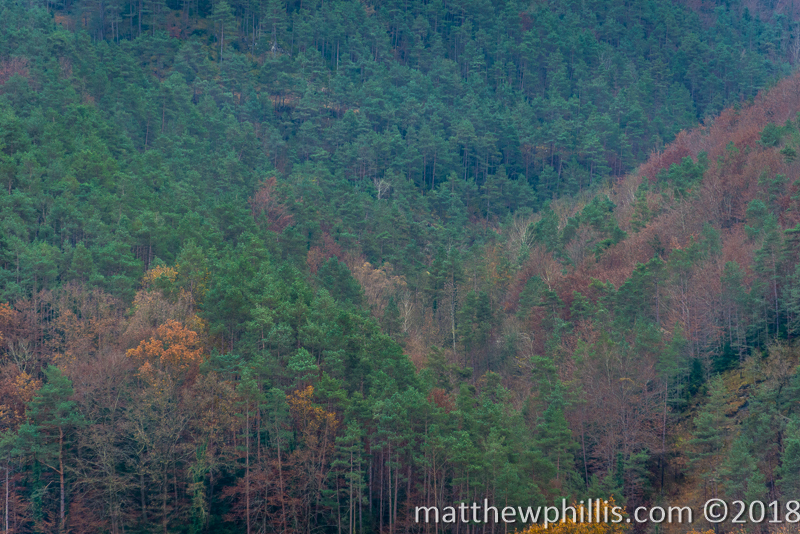 Peeking through the tree - Sant Joan de les Abadesses. Taking it easy on a chilly Sunday. 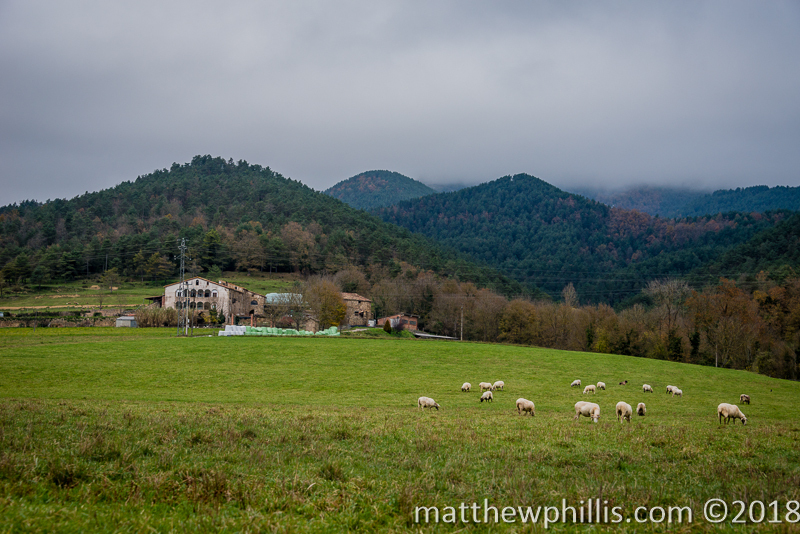 After a 'cafe amb llet' (flat white) and a 'bikini' (a ham and cheese toastie, not the swimwear), we headed out along the path on towards our destination, Sant Joan de les Abadesses. Once there we'd need to work out if we could get the bus back, or if we'd have to walk it back to Ripoll - the decision would be made over some food and maybe even a beverage of course. We followed the path through the countryside - with nobody else doing the walk this day, we had the whole place to ourselves, apart from a friendly moggie. 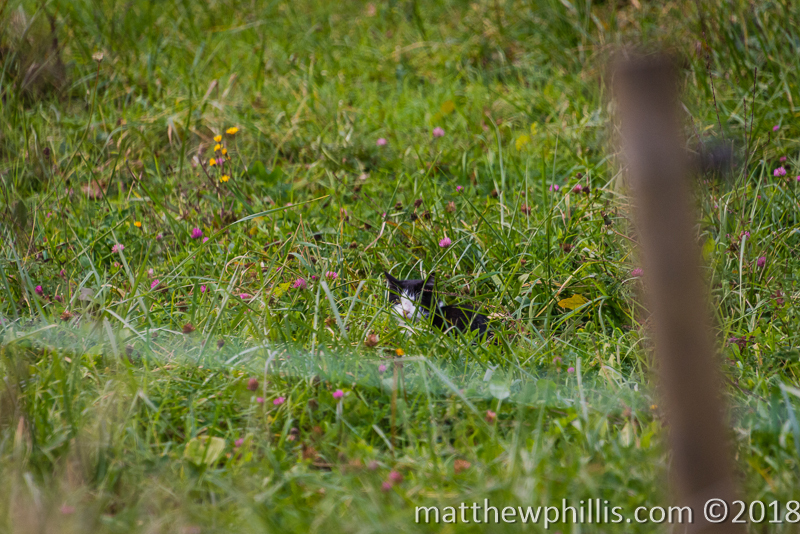 This cute kitty was just sitting on the side of the path, seemingly waiting for someone to walk past and pat him. He had a quick pat and cuddle, he followed for a bit, before wandering off to do whatever cats do around here. 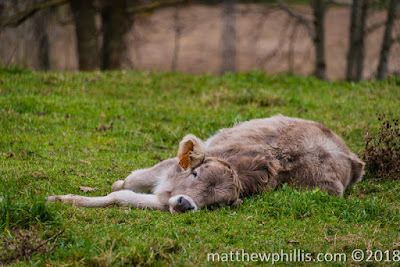 We walked past fields full of cattle, trees that had lost most of their leaves and were hunkering down for the coming winter, but mostly green landscape surrounded us, mist hanging onto the hills and trees everywhere. Occasionally there were some farmsteads and even some long-forgotten stone farm houses, no longer inhabited, left to crumble and fall apart. Someday, I always dream to myself, I'll come back and buy a Catalan 'masia' and fix it up, have my garden and animals, hold big parties with my friends and live a nice, peaceful life in the countryside. Maybe one day. We made it easily to town, feeling good and although not sore at all, we knew that we'd done a bit of walking. We checked the bus times, and being Sunday, they were hardly frequent. The next bus was in around 3 hours, not what we were hoping for. We decided to sit down in a nice warm bar to warm up, snack and 're-hydrate' a little before the bus. We walked into one place and were asked 'if we were eating.' This is a common question in this country, especially around 2pm, which is Catalan lunch time, when most people get a 'menu.' These daily specials have 2-3 courses, including wine and a coffee, for a bargain price. We didn't feel that hungry and had decided on a drink and some tapas, but we were told that we couldn't sit at the bar, only the restaurant. So we said we'd sit in the restaurant, but were then told we needed to be eating if we sat there. We explained that we wanted a drink first, then we would decide, but the lady was pushy and ended up losing our business. We found another, far more accommodating place, for our beer. Doing whatever cats do around here. 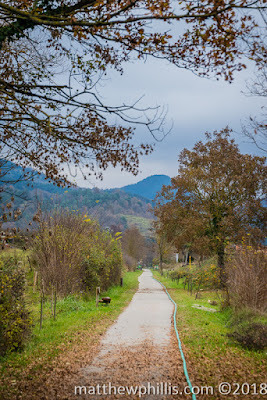 In the end, we decided to walk back to Ripoll rather than wait around for the bus that may or may not even decide to turn up - we were in rural Catalonia on a Sunday after all. The walk back seemed a lot faster for some reason. Maybe the fact that we were already warmed up from walking before, or the hot food, cold beers or maybe it's just always faster when going home, I don't know, but it passed quickly but still enjoyably. The train ride also seemed faster, but that was definitely due to the nap that I had on the way. Overall a good day's out - walking, good company, beautiful scenery and a recharge for the batteries before work on Monday. A lovely Sunday walk... maybe I'll come back in Spring.